Maria’s grandparents lived in this house, before she and her husband Ion took over the smallholding, in a countryside village about 15 minutes drive from Iaşi. 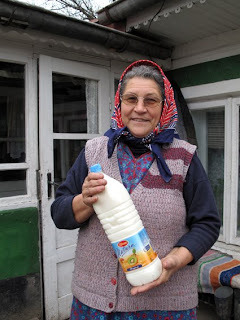 Maria has delivered handmade cheese, cream and occasionally milk to nine customers’ homes in Tataraşi, every 10 days or so, for the past 40 years. Some of the older people died and now she delivers to their descendants. She delivered these products throughout the communist era, outside the state’s rationing system of the 1980s: a small-scale, subsistence ‘black market’. Some years Maria sells wine, but this year she’s putting it aside as her son is getting married this coming summer. They sell homemade plum brandy. They have various fowl, goats, sheep, cows, horses, honeybees and a dappled, snorting pig, which is being fattened up for Christmas. We were talking in Maria’s back room of her house, when she flung open the doors of a cupboard to reveal her cheese-to-be. Each day she milks the cows and stores the milk in these earthenware jars. 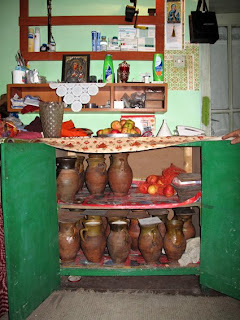 The jars were made by Roma pottery makers, who used to come around and sell at the door, but they don’t come anymore, so when Maria breaks a pot, she can’t replace it.